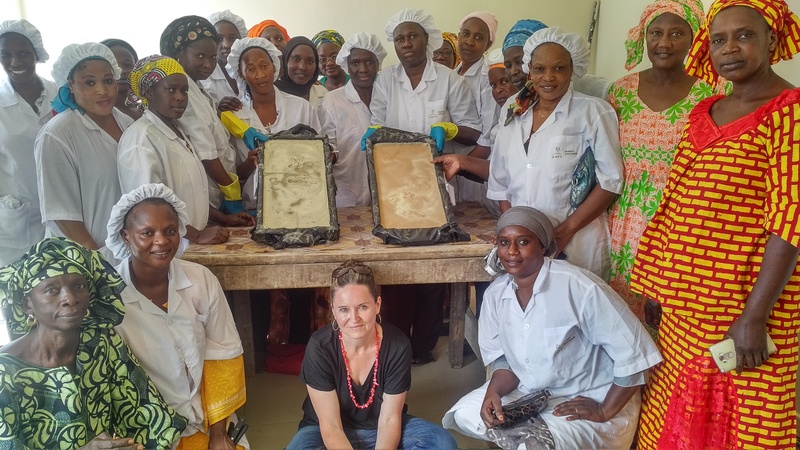 In December 2017, Monica Norley implemented her 3rd assignment in Senegal, training two groups of women in soap production. The groups have already reported improvement in their skills related to soap production, business planning and management, and safety measures. Our F2F Senegal staff are impressed with Monica’s great patience, understanding, humbleness and ease to work with. In addition, because of Monica, the staff have developed a passion for soap making. Monica shares her experience as an F2F volunteer. Volunteering is something I have done for years ever since being a Peace Corps Volunteer working in the area of small business development in Guatemala in 1995-97. Since then, in one form or another, I have been involved in international development, namely women’s economic empowerment and fair trade. Honestly, this kind of work is my passion and I definitely plan on volunteering for these types of assignments for as long as I am able to. 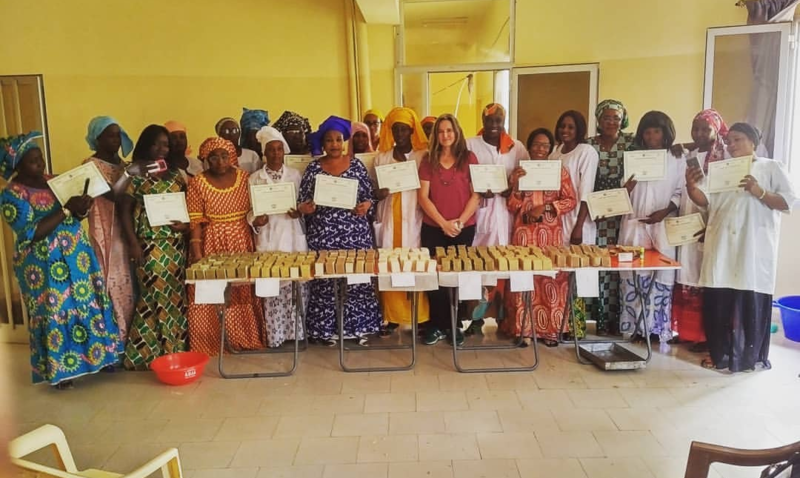 I can easily say that the highlight of working with Winrock Senegal this past year has been the relationship I have forged with the women of COFLEC, particularly the newest soap making arm of the cooperative. Never before have I met such a motivated, smart, attentive, harmonious group. Everything about our training seemed perfect and it just flowed. I bonded very quickly with them. Their commitment to their local community and other women is impressive. After our first soap making training in June, they went on to train further 70+ women, growing the group to nearly 100 members. We established a natural range of soap for them made from palm kernel oil, shea butter and other locally-available agricultural inputs such as hibiscus, peppermint leaf and dried orange peel (to serve as natural colorants and exfoliants). The quality of soap they are now making is superb and they have retained virtually every bit of knowledge I shared with them. Their future is bright if they maintain their momentum! I was fortunate to be assigned to Senegal on three occasions in 2017 and to work mainly with one group. I haven’t been able to have that sort of continuity with any other assignment before. It really makes a difference when you are able to foster a relationship with a group of people, gauge their progress, get to know their needs and challenges and hopefully, be able to ensure a much larger, beneficial long-term impact. I feel it is extremely important, especially in current times, to keep abreast of what is going on in the world, continually stretching one’s mind and keeping one’s fingers on the pulse globally. I wouldn’t want to imagine my life without these experiences as my worldview would indeed be so much smaller and limited. The vast differences in culture, language, landscape, traditions, attitudes, etc., have only served to enrich my life, especially when we live in a time of such political and social upheaval. These trips always help me in my quest to approach every person, situation or conversation with empathy, understanding and hopefully, a broader perspective. I also believe strongly that we are far less judgmental when we actually get out into the world and experience as much as we can of it. The advice I would give a new volunteer is to just jump in and do it! Try not to get too overwhelmed or nervous about an assignment and instead, just trust your own skills and knowledge and embrace the adventure. Also, things don’t always operate on the same time scale or expectations as back home so be flexible and gentle with yourself as well as the groups you work with. For example, you may have spent hours preparing a beautiful PowerPoint presentation (I’ve been there), only to arrive and find no electricity, internet or way to use it. So be creative and prepared to scale things back to basics if you have to. I guess my Peace Corps experience taught me that lesson long ago! My assignments have definitely made a difference in my own life. I live a simple, minimalist existence on an old Dutch barge in the UK and when I return home, I am always much more keenly aware of how much I consume, materialism, commercialism and the vast opportunities around me. Every trip is a cause for reflection. I honestly often hibernate a bit after I return as sometimes I find it difficult to jump back into society at home. I strongly believe that a life of service gives us joy and many rewards. Volunteering is a win-win situation for all. When we give, it often comes back to us tenfold. I have always come away from every volunteer assignment feeling perhaps that I have gained more from the experience than anyone else has from me. I think everyone should volunteer from time to time. You might teach someone something or open their eyes to something they are hungry to learn about but believe me, it all comes back. I really enjoy working with Winrock. The communication and support is always superb before, during and after every assignment. All the coordination that happens prior to every trip is done efficiently and professionally. The Winrock team in Senegal, led by Mama, feels a bit like family to me now. The word in Wolof for hospitality is ‘teranga’ and Senegal has a reputation for being the country of teranga. I can easily say that working with Winrock in-country and getting to know everyone there was a highlight of 2017 for me. Friends and family have always been very supportive and interested in the volunteer work I do abroad. Everyone who knows me acknowledges fully that this is simply an integral part of my life, who I am and something I find a lot of joy and personal reward in. I feel lucky to be able to share my experiences with everyone as hopefully it opens some windows to the world for some and allows people to experience a bit of what I do, if even vicariously. I think also these assignments serve to break down stereotypes, impressions and misconceptions, and I like to play a role in that. I do freelance business development/sales for an educational technology company where I am based in the UK. This provides me the flexibility to volunteer as and when I wish as I can do my paid work from virtually anywhere. I also work as an international development consultant for a handful of nonprofit organizations and am a volunteer business adviser for Irise International, an organization which works towards empowering women and young girls in Uganda namely through menstrual health education and social enterprise development. I always like to keep in touch with host organizations and I have most certainly done so with the women of COFLEC. In fact, we made a pact that I would return for an advanced soap making training if they met a number of agreed-upon goals/milestones. They kept their word and so did I and I returned to Senegal for a third time in November/December 2017. Now, I will be monitoring from afar how they are keeping up with their sales forecast and production schedule. I am working on a simple design for soap packaging for them. I have determined all their costs of production and with coordination from Winrock in Senegal, we are working to source affordable, bulk quantities of essential oils for them for scenting their product range. I am also prepared to do continued marketing for them through various social media outlets. I could share many examples of achieving greater cultural understanding through person-to-person interactions when it comes to these assignments but perhaps I will give two highly poignant examples. When Senegalese women tell me that most men don’t want women to earn and have their own money because they are afraid of them having power, they are surprised to hear me tell them that that isn’t just unique to Senegal. And when women confide in me in our soap making trainings the pressures they feel to use skin-bleaching products, I am, in turn, able to share with them how women in my society are often bombarded by anti-aging products. These might sound like simple examples but they are actually quite profound, empowering experiences to share with these women. It allows me to establish a rapport and solidarity with them and make them not feel so alone. Quite simply, I love it! I would do it all the time, if I could. Last year, aside from three stints in Senegal with Winrock, I also went to Liberia twice with ACDI/VOCA. I love how every assignment challenges me, forces me to grow in different ways personally and professionally and also helps me to build my portfolio of work. I also find volunteering incredibly grounding. With each assignment, I am able to step away from my own little world back home, get a fresh, different perspective and often times, a much needed attitude adjustment. I always come away from every assignment having learned many things and I love the educational aspect of this work very much. I guess the main thing that has been reaffirmed for me over and over is that people are actually the same the world over. Regardless of educational background, culture, upbringing, language, etc., we all just want the same things. People are gracious and wonderful wherever you go and I think that is easy to forget sometimes. I have also learned how fabulous a country Senegal is! Dakar is a cool city and the beaches and islands surrounding it are divine. The Senegalese seem to have achieved a pretty good balance of embracing modern aspects of life while also holding on to tradition. I will happily return to Senegal anytime. 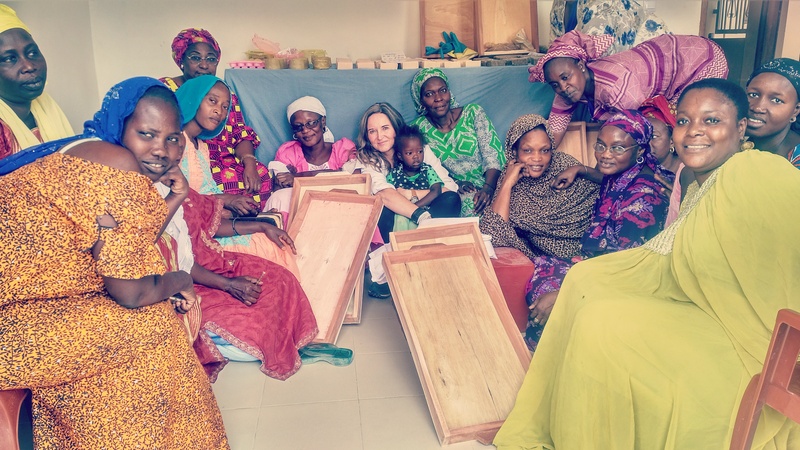 Thank you, Monica, for all your hard work in helping to improve soap making in Senegal!